Now that it's almost the middle of October and the Apple iPhone 4S is setting records before getting released, the Samsung Galaxy S II is a couple of days away from getting launched on its third and last major U.S. carrier, and the Google Nexus Prime is soon to be announced, you would think that we would have a little time for a breather. 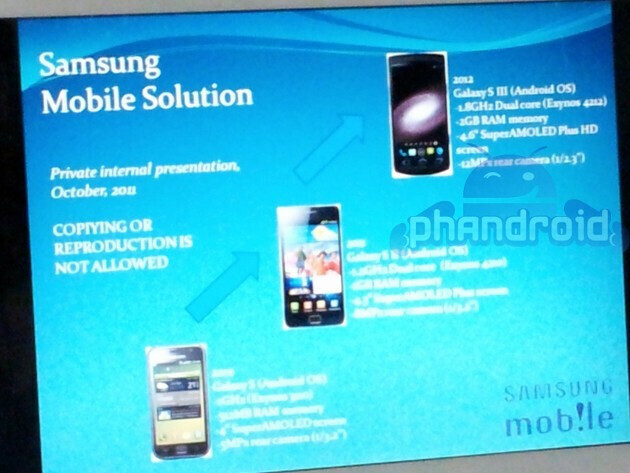 But instead, Phandroid was sent a picture of a leaked photograph of a slide that allegedly shows off an image and the specs of the Samsung Galaxy S III. According to the slide, the phone will have under its hood the recently announced Samsung Exynos 4212 which will run at 1.8GHz with 2GB of RAM. The back camera will be a 12MP shooter with a backlit CMOS sensor that improves picture quality in low-lighting situations. The display is said to be 4.6inches of Super AMOLED Plus HD, which is the same display expected to be used on the Google Nexus Prime, but with true RGB matrix, not the PenTile arrangement. Other details not mentioned on the slide include NFC and LTE support and will not have the curved glass on the display like on the Google Nexus S. Additionally, while the Ice Cream Sandwich build does not require the four buttons on the front of the device, the Samsung Galaxy S III will have them anyway. Lastly, the phone will look a lot different than the current model so that Apple won't be given a chance to block sales of the device by telling a court that it looks too much like the Apple iPhone. Apple and Samsung are expected to hear a ruling this week from a District Court in California on Apple's request for an injunction preventing the Korean based company from selling certain models in the U.S., including the Samsung Galaxy S II, because they look too much like Apple devices. As far as the legitimacy of the slide is concerned, the white space around the pictures of the phones on the slide indicate that someone might have used "paste and copy" and the art work on the slide seems a bit unprofessional, so keep in mind that these specs could simply be coming from someone's creative-but devious-slide. I say its fake... why keep it at Dual core when you can go Quad core. The slide doesnt even look like its made very well either, samsung wouldnt do that. yeah its fake. aside from the wrong specs of glaxy S, I feel that the aspect ratio of SIII is not 16:9 or 16:10. which an HD screen should have. ( well at least Im sure samsung would make their AMOLED HD with that aspect ratio.) AND, I think the picture pf galaxy S III is nothing but a fogy picture of a samsung WAVE. or WAVE 2. I'm reserving judgment on the veracity of the image for now, but if it's real then it looks cool. I wish it was clearer though. Hope this is true, but really, how likely is it that a professional slide, even in-house, would misspell "copying"? The GSII is barely starting sales in the U.S. and already the GSIII is being flogged. I just hope the GSIII gets released in the U.S. sooner than the GSII did. 1 month-ish before obsolescence is kinda sucky. Why do these tech sites post fake, non-credible news? This Nexus Prime needs to be released already or make an announcement of a release date. If not might just settle with an iphone 4s at least you know Apple will release one every year so one can forcast their contracts a lot more efficient. And worse case I will grab sg3 when its released in the states. FAke.. but if it were true , its way to soon for galaxy s3 !! There is ABSOLUTELY no way that this is real. This is some serious s**t!!!!! doesn't it look like the phone that was allegedly the nexus prime in that leaked video where the person is showing off ics. You know.. Samsung is Korean company (of course thousands of Korean engineers, and Korean board members) and most internal discussions/presentations are proceed over Korean language unless those are announcement for foreign market. This slide could be presentation for some U.S. carrier but pretty unreliable quality same as previous leaks about Galaxy S2. And GS3 device looks darn horrible. Looks like the Samsung Gem, which was a piece... However, those specs are incredible. What games or applications would require specs like those? Can't imagine it being anything else but boring. Didn't they just make a phone like yesterday? Yea... the GS2 just came out...HERE. But the phone is about 8 months old. So a new GS3 phone should be making an appearance, at least on the global market, very shortly. Fake!!!!! 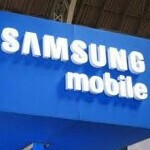 Samsung just developed the 1.5 Ghz chip and 16 megapixel camera weeks ago.